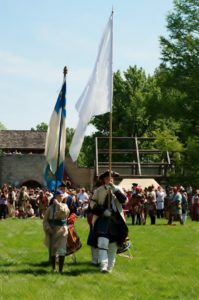 The 48th Annual Rendezvous at Fort de Chartres is fast approaching! 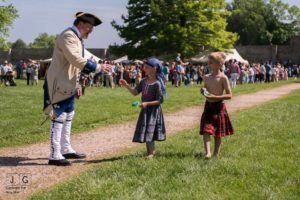 On June 2 and 3, 2018, the June Rendezvous will once again take its place as the Fort site’s signature event, attracting thousands of visitors and participants to the region. 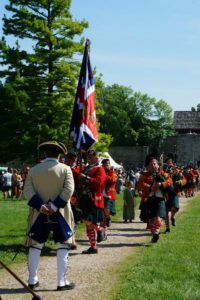 A recent repost from Fort de Chartres Store Facebook post by page author Dave Horne captures the history and spirit of the Annual Rendezvous at Fort de Chartres. 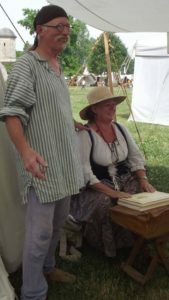 Dave and his wife Debbie had their time as proprietors of the Fort de Chartres Trading Post on site, spending their tenure at the Post as one of several vendors in that site building through the years. Their Facebook page is testament to the love of the Fort and its history. It is such an important testimonial of that history combining historical accounts with modern retelling, photos, and documents. From the bottom of our hearts, we thank their efforts to keep the narrative of the Fort’s history alive. And please join us this first weekend in June to celebrate this history and experience first hand the magic of Rendezvous! I was recently asked to write a history of June Rendezvous. My first thought was that this will be easy, as Elmer Keith said “Hell, I was there”. Then I realized, Hell, I don’t remember half of that. I also realized in the early years I was only a participant. I had no idea how Rendezvous worked or what was involved in making it happen. I just showed up had a good time and went home. So as I started to do some research I had another realization, nobody bothered to write anything down. I found a couple of magazine and newspaper articles and had access to some old Rendezvous programs and flyers and most of the Gun Club newsletters. It would be fun to spend the time and interview people who were there and do some more in depth research. But it would be a book, a big book. And the stories! Stories about Marv Hilligoss would take a whole chapter. Right now I’m facing a deadline, and way behind. I just have time to hit the high spots, so I know I’m leaving a lot out, but briefly here’s what I think I know. I suppose to understand Rendezvous’ history we have to start at the beginning. In the 1960’s a group of people had become enamored with shooting black powder muzzle loaders and wearing historic clothes while they did it. This evolved into camping out in primitive shelters and using old timey camp equipment and gathering for scheduled meetings to camp and shoot, Rendezvous. Somewhere along the way they became known as “buckskinners” to differentiate them from the more traditional black powder shooters who wore bib overalls and camped in a motor home or motel. This buckskinner movement gained traction with the Civil War reenactments of the 1965 Centennial of the Civil War, the premiere of Jeremiah Johnson at the movie theatre in 1972, and there was a virtual explosion of interest during the 1976 Bicentennial celebration. Along about the same time people who were involved with the State’s Parks and Conservation Departments became interested in having special events. Special events were seen as two-day, weekend programs which either recreate a specific period in time at historic places or memorials, or highlight outstanding natural resource areas by ecological or recreational programming. Special Events by their very nature involve people of all ages, diversified and organized clubs, and many individual enthusiasts in varying areas. By encouraging public participation, either by direct methods such those mentioned or by the indirect method of reliving the past through simply attending, the hope is to instill awareness and an appreciation in people which will lead to public desire for preservation of our valuable resources. In 1969 a small group of buckskinners had a camp out and shoot at Fort de Chartres. Whether it was then that these two groups came together or it was a trial run after they had already met, I don’t know, but the result was the conception of “Rendezvous”. It was either a passionate union of opposites attracting or a marriage of convenience, as the buckskinners were used to doing their thing for their own enjoyment, on private property and by their own rules and the State Special Events people were all about involving and educating the public. It was, if nothing else, an interesting relationship. AND SO THE VERY 1ST SPECIAL EVENT IN ILLINOIS FORT DE CHARTRES RENDEZVOUS WAS BORN AUGUST 8 AND 9, 1970. There was approximately 25 camps. Participants recall that the weather as especially hot and humid. Demonstrations included blacksmithing, pottery throwing, French Colonial cooking, and firing the cannon. Some of the contests at this first Rendezvous were the round ball target competition, the tomahawk throw, and the tug-of-war. The greased pole climb where the winner could put the garter snatched from the top of the pole on any lady he wanted was enjoyed by spectators and participants if not by the lady who was chosen by the winner. On Saturday evening the festivities moved to Ste. Genevieve, Missouri. Participants were treated to a tour of this historic town and a dinner at Cafe Genevieve. At 9:30 P.M. a torchlight parade of voyageurs to the Mississippi ferry crossing began. On Sunday the program began with mass being celebrated in the Fort de Chartres chapel and a breakfast being provided for the participants. Craft demonstrations were again provided for the public. Attendance for the two days was estimated at 8,000 spectators. Thanks to the efforts of all those involved, the first Rendezvous was judged a success. 2nd ANNUAL SEPT. 18-19, 1971. By the second year the event was called Traders Rendezvous and enthusiasm for the event had increased significantly despite the lack of cooperation on the part of the weather, it started raining Saturday afternoon and never stopped! As a result, attendance dropped considerably from the previous year. Nevertheless, the number of craft demonstrations, contests, and participants had tripled. Several local and out of town groups set up food stands and sold to the public and the participants. 3rd ANNUAL TRADERS RENDEZVOUS JUNE 17-18, 1972. With warm sunny weather both days, the attendance soared to over 19,000. Using the fort as a natural setting, the program diverged into three primary activity areas: music of the period, cultural demonstrations, and muzzle loading and voyageur contests. For the second year in a row the village of Prairie du Rocher hosted a torch light parade and a street dance, thereby celebrating its 250th birthday as the oldest chartered town in Illinois. 4th ANNUAL TRADERS RENDEZVOUS JUNE 23-24, 1973. This was the 1st year the event was held in June. Attendance at the fourth annual Rendezvous rose to over 21,000 spectators. 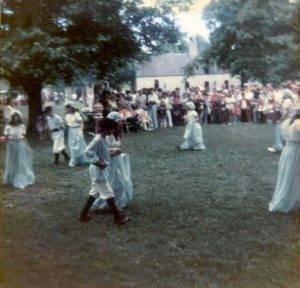 A notable addition to the 1973 program, in addition to craft demonstrations, period music, and muzzle loading and voyageur contests, was the appearance of “Le Rochey Dansants,” the children’s minuet group. 5th ANNUAL TRADERS RENDEZVOUS JUNE 8-9, 1974.During the day on Saturday the weather was fair. That night, however, there was a severe storm, causing many campers, participants, and crafts people to leave. But Sunday’s weather was nice, and the two-day attendance rose to over 22,000. One notable change in the 1974 event was that the demonstrating craftspeople were allowed to sell their products for the first time. RENDEZVOUZ IS FIVE NOW AND LIKE A 5 YEAR OLD, LIKES TO RUN AROUND AND PLAY IN THE DIRT, SOMETIMES LOUD AND UNRULY BUT STILL LOVED BY EVERYBODY. 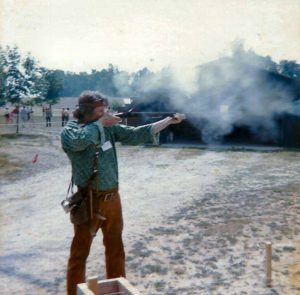 6th ANNUAL FORT DE CHARTRES RENDEZVOUS JUNE 7-8, 1975 Enrollment in the 1975 shooting matches reached an all-time high of 272 registered shooters. Exceptional eighteenth-century encampment displays were provided by both the 2nd Virginia of the Continental line and the British Black Watch of Cincinnati, Ohio. Attendance at the 8th annual event was down considerably from the previous year 13,265 spectators. One of the innovations at this year’s event was the moving the buckskin campground to the field east of the fort. 9th ANNUAL FORT DE CHARTRES RENDEZVOUS JUNE 17-18, 1978. Attendance at last year’s event rose to over 16,800 spectators-due in part to Saturday’s sunny and hot weather. Unfortunately, Sunday was rainy. For the first time La Compagnie des Amis de Fort de Chartres sold “marchand” licenses to blanket traders at the event. The proceeds went to the organization to be used for future projects at the fort. 10:00 A.M Posting of colors. Voyageur flotilla leaves Fort de Chartres landing, arrives at Pierre Menard at approximately 12:00 noon. 1:00-3:00 P.M. Visitors’ Shoot-Firing line-25 cents per shot-Children under 14 must be accompanied by parent. This all came from a 10th anniversary program of the rendezvous in 1980. AND SO THE BIG BIRTHDAY, 10 YEARS OLD. “JUNE” RENDEZVOUS IS STILL RAUCUS AND GREGARIOUS AND ROWDY BUT STARTING TO GROW UP AND THINK SERIOUS THOUGHTS ABOUT THE FUTURE. It’s now the glory years, record attendance by participants and the public. The State flush with cash, is eager to spend it on Fort de Chartres restoration and archaeology and it’s famous June Rendezvous. 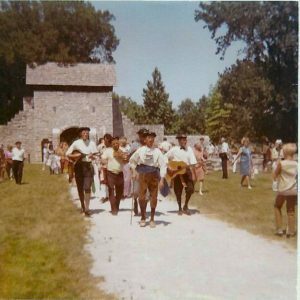 In 1979 or before the Fort’s flintlock gun club, Les Coureur de Bois de Fort de Chartres is sponsoring the Rendezvous, providing volunteer labor and a audited Site Superintendent Special Event Discretionary Fund to keep the funds at Fort de Chartres. In 1984 the official count of camps was 335 – 78 lodges, 26 marquees, 63 wedge tents, 73 whelan and baker tents, 58 lean tos or lean pees and 14 wall tents. In 1991 the 10% surcharge for food concessions was added to the special event fund. In 1992 Rendezvous camp was broken up into counties with lanes named and each county to have it’s own dog soldiers and a Governor. In years past firewood was provided but in 1993 the State started to sell the firewood. Also in that year paint striping equipment was used to mark the roads and camping areas, and the Fort Gun Club rented 2-way radios for the dog soldiers and booshway. It may be the record, at any rate it was a huge turnout for participants that year with 781 camps. AND THEN DISASTER, THE GREAT FLOOD OF 1993. Fort de Chartres is no stranger to floods but this one is different. In August the whole Park is inundated by 15 feet of muddy turbulent Mississippi river water. And when the water recedes the damage it leaves is heartbreaking. Picnic tables and shelters were lifted off their moorings, tossed into the raging river and dropped hundreds of yards from where they belong. Out buildings lifted off their foundations and carried downstream, deposited unceremoniously where ever they come to rest. All the plant life dead and brown, everything covered with mud and sand and huge holes scoured into the ground from the rivers current. The staff and volunteers start right away to clean up and repair the damage. Early in 1994 it becomes apparent the work will take a long time and June rendezvous is cancelled. The grounds and Museum finally open sometime in Sept. and the State vows to make 1995 June Rendezvous bigger and better than ever. Rendezvous did come back, maybe better but not necessarily bigger. The price of gas went up, more and more festivals, rendezvous and events were taking place everywhere. People, especially kids became more enchanted with new technology than old time skills. Also the budget crisis in Springfield started to raise its ugly head and although it would be a decade before the real effects would be felt, something was in the wind. The participants still came and so did the spectators but the bubble had burst and the glory days were over. RENDEZVOUS HAS MATURED, NOW A YOUNG ADULT RESPECTED BY THE COMMUNITY, KNOWN ACROSS THE COUNTRY, EVEN DIGITARIES AND GOVENORS COME TO SEE HIM, BUT HE KNOWS NOW THAT MISFORTUNE LIES JUST AROUND THE BEND, AND NOTHING CAN BE TAKEN FOR GRANTED. In 2000 the official camp count is 410, down 50 from the year before. The Gun Club buys 5 2-way radios to be used at Rendezvous and there were discussions of buying carts to help people pack in and out if it rained and the grounds were muddy. The Gun Club discussed in 2002 that there was no job description of the Booshway or the Head Dog Soldier. The Fort had 24 sashes for the fire watches and dog soldiers. 2003 June Rendezvous was a success with 440 camps and the weather was gorgeous. A special thank you was given to Booshway Mary Rill for keeping the puppy soldier tradition alive, they will be known as “Roosters’ Rangers” in honor of Rooster. In 2004 the weather was great and there were no problems to speak of. One minor complaint of excessively late noise and underage drinking from one individual, but as far as Rendezvous goes, this was definitely one of the more quiet ones. The number of camps was up slightly and the number of traders was also up. Unfortunately the number of visitors was down. There could be several reasons for this; the recent Lewis & Clark activities, the looming threat of bad weather, and the general “same ole same ole” routine of our Rendezvous. It was probably a combination of all these. 2005 Rendezvous was one of the better ones. The weather got a bit warm with a high on Saturday of 95* but we had a nice breeze on Sunday which made it more tolerable. The number of camps were up. The total came to 448. Visitors numbers were also up at 15,455. This year we also had a couple of new “street performers”.”The Amazing Budabi Brothers” and “The Clockwork Clown”. Both of these did a great job and were well received. Rifle and Smoothbore competition was moved closer to the Rendezvous and is now located near the levee just East of the fort. This was applauded not only by the participants but also by the visitors who now do not have to walk as far to watch. The rifle match was set up “old fashioned” style like we did more than 25 years ago with “cutting the card”, “splitting the ball on the ax” and other breakable targets. At the 2007 Rendezvous overall public attendance was down 250 cars but participant attendance was up 12 camps. Dressing out & driving in came up, next year the site will implement some form of one time pass system that will limit drive-in/outs by participants. Same goes for vendors they will be issued a special vendor pass to alleviate the confusion about who’s a vendor and who isn’t. Dressing out while in camp will be added to the event rules for next year since it’s an unwritten rule at this point. Debbie Horne brought up the point that though the weekend attendance was down the mid week public attendance was up dramatically. There were some bus tour groups passing through as well and not dressing out after camp is setup presents a poor photo and public relations opportunity. AND OF COURSE WHO COULD FORGET RAINDEVOUS 2013. There was record rainfall the couple weeks before Rendezvous and the threat of a rising river. Finally it got so bad that IHPA staff drove down saw the flooded ditches and roads and heard that Prairie du Rocher would probably close the flood gates on Rte. 155, and Rendezvous was officially cancelled on early Sat. morning. The problem was everybody was already there. And spectators were showing up. So, Rendezvous went on, the drummers drummed, the fifers fifed, the shooters shot and the demonstrators demonstrated and the spectators spectated. And so it goes…. RENDEZVOUS HAS AGED, ALMOST 50 AND AWARE OF IT’S MORTALITY. LIKE AN OLD RODEO COWBOY, HATED BY SOME AND LOVED BY MOST, WHO PARTIED A LITTLE TOO HARD IN HIS YOUNGER DAYS, NOW HE’S CONTENT TO SIT ON THE FRONT PORCH AND WATCH HIS GRANDKIDS PLAY.